Labor Law Pointers - Volume VIII, No. 5 | Hurwitz & Fine, P.C. I start out this month with a cartoon borrowed from the Buffalo News called "Close to Home" by John McPherson. I think it captures exactly the predicament that many contractors find themselves in while attempting to obtain insurance in New York State. 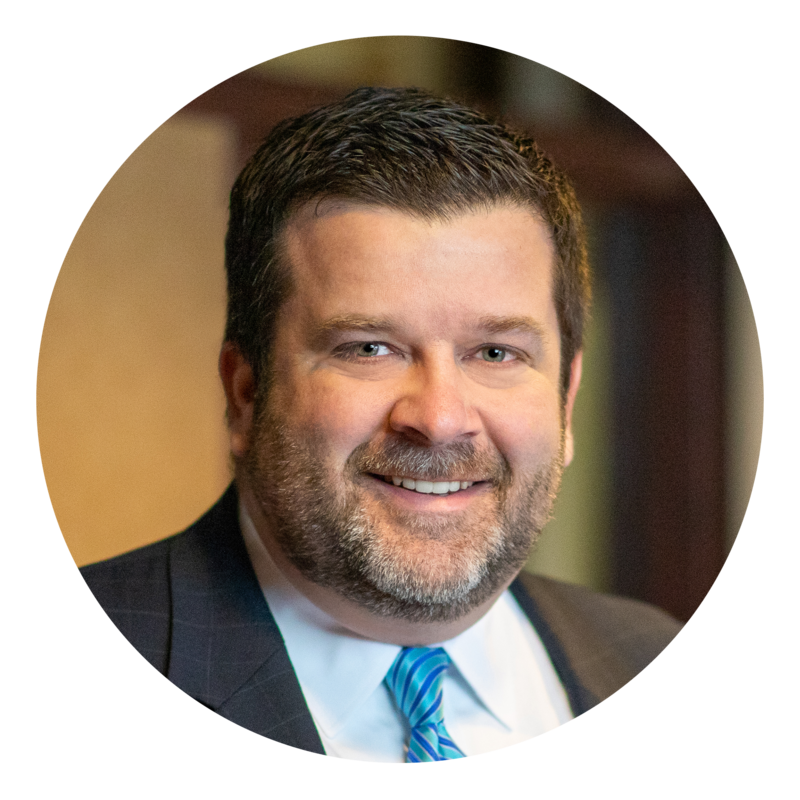 A rapidly growing portion of my practice is devoted to assisting contractors and owners of property in developing contracts that afford them risk transfer protection for construction type activities. The pressure on contractors to obtain insurance and provide proof of that insurance has lead, in many cases, to situations where an owner believes they are covered under a contractor’s policy but the policy has exclusions for Labor Law type activities. If any of our readers, or clients of readers, would benefit from this type of assistance, please feel free to reach out to us. We understand the tight rope that contractors need to walk to obtain insurance while maintaining a low enough bid to attract business--all while obtaining insurance that will cover the risk involved to the satisfaction of the owner or general contractor. We also counsel property owners and contractors on the contracts they should require and the coverage they need, as well as the coverage they should require from their contractors and subs such that they are appropriately protected by risk transfer. Addressing risk transfer through Additional Insured status, contractual indemnity and contribution, and common law indemnity and contribution is an essential element in representation of clients who participate at any level in projects invoking the Labor Law, and we are available to assist at every turn. 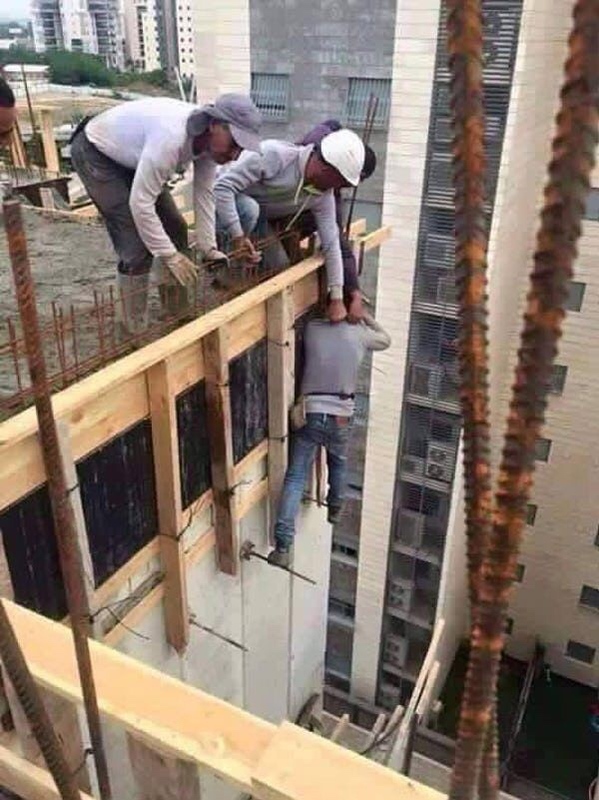 Moving on to more humorous images, we have a worker who has decided that working while standing on rebar many stories above the ground using the hand strength of his co-workers as his only safety device is a great idea. When the inevitable occur--and his foot slips and his co-workers lose their grip--will he have a valid Labor Law case? The answer to that question is a resounding yes. Remember that a person can’t be a safety device under most circumstances. 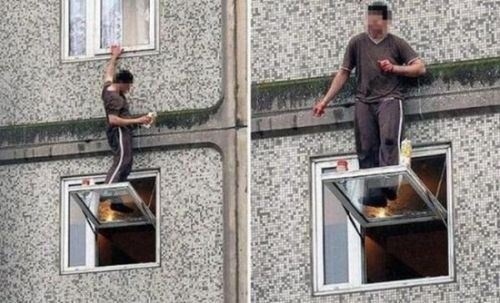 Even if the co-workers holding on to his shirt were to be considered a safety device, their failure to prevent the fall of the plaintiff would mean that they, as safety devices, failed, and thus the plaintiff would have a valid §240(1) case. 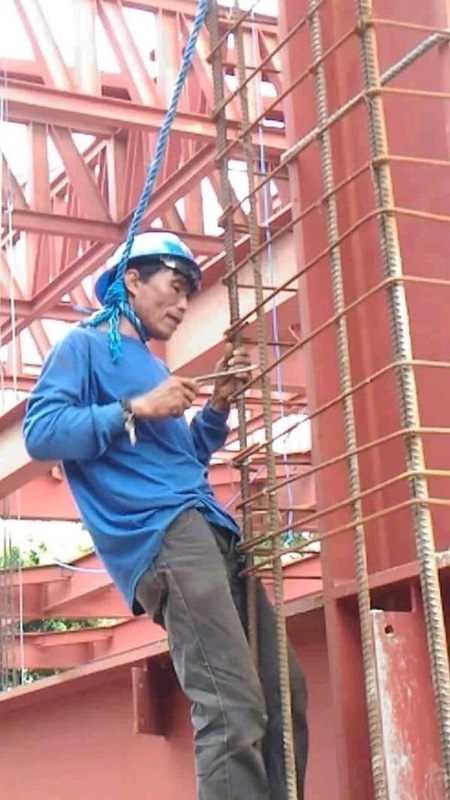 Next we have a worker tying rebar together who is not being held by co-workers, but rather has employed a novel type of safety harness made entirely of blue rope. When he falls, and the safety device stops the fall, but unfortunately causes injury to the plaintiff, will he have a valid Labor Law case? First off, I think that I would work very carefully if I had a rope around my neck while working and it may actually cause me to be sufficiently careful that I do not fall. Here, the injury sustained by the plaintiff when he falls does create a valid §240(1) claim. The plaintiff need not fall to the ground to have a claim and an injury sustained while preventing a fall is generally grounds for a valid §240(1) claim. Here, the injury would be caused by an inadequate safety device, and it is my estimate that a court would not even require any expert opinion to reach that determination. Next we have a photo taken right outside my office door. 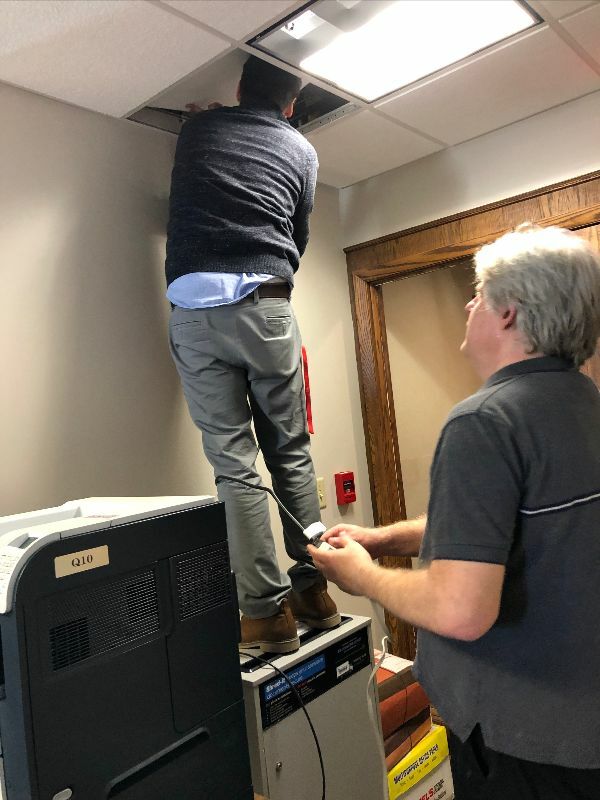 Employees are running an extension cord through a ceiling and over a wall to set up a new printer in that location. One employee is standing on the shred bin to enable him to reach over the wall and pass the cord to the other side. If he were to fall while doing this, would it be a §240(1) case? If the cable were simply being passed through the suspended ceiling and over the wall without the need for any drilling then it would not qualify as an alteration and no §240(1) case would result. If, on the other hand it was necessary for the employee to drill a hole to pass the cord over the wall, then an alteration did occur and he has a valid §240(1) claim against the building owner. I have no idea if he needed to drill given that, as soon as I saw him up there, I took a picture for use here and ran to my office and closed the door not wanting to provide any type of supervision, direction, or control over the means or methods of his work. Next, we have a window washer hired to clean the windows of a private owner’s condo. When the window gives way and he falls, is it a §240(1) case? I am sure that you all recall that, with very limited exceptions, window washing for commercial buildings is a covered activity and window washing for private individuals is not. Thus, this brave but foolish window washer is not going to be provided the protections of the Labor Law when he falls from the window and someone else is going to need to clean his footprints off the glass. As always, thanks for your interest in our newsletter. Please feel free to pass it along to anyone you feel may benefit from it or merely find our photos to be amusing. I do enjoy getting photos from readers, so feel free to send whatever you think may be appropriate. Hope you are all enjoying the early spring weather; we are sneaking a few final weeks of skiing in here, but are looking forward to the ice leaving the lake and the temperature becoming more enjoyable for all. Please feel to reach out to any of us with your “situations,” questions, or concerns. Thanks for reading. Plaintiff allegedly fell from a ladder while installing light fixtures in CLDN’s building. Due to the location, he was forced to install a portion of the light by standing on display cases approximately 20 feet high, and then returning to the top of the ladder to finish that portion of the installation, which was located partially over the cases. While attempting to maneuver himself into position on the ladder, he lost his balance and fell. The trial court denied plaintiff’s motion for partial summary judgment on the Labor Law § 240(1) claim, and denied the cross-motions of CLDN and of third-party defendant to dismiss that claim. The First Department unanimously modified the trial court’s order to grant plaintiff’s motion for summary judgment, finding that whether the ladder shook prior to his fall or during that period of time when he was attempting to recover his balance irrelevant, since the ladder was an inadequate safety device for the work being performed. The Court rejected CLDN and ECG's sole-proximate-cause argument as unpersuasive, since it was undisputed that the ladder was unsecured, the worker who had been holding the ladder walked away only minutes before plaintiff’s incident, and because plaintiff's stance was necessary to perform the work and the ladder was not defective. PRACTICE POINT: The courts discussion of it not mattering if the ladder shook needs further analysis. A fall from an appropriate safety device which does not shake or move is not a Labor Law case. Here the court is holding that the ladder need not have moved and they make that distinction as the ladder was not, in their opinion, an appropriate safety device for the task being undertaken, given the need for the plaintiff to maneuver himself into position. 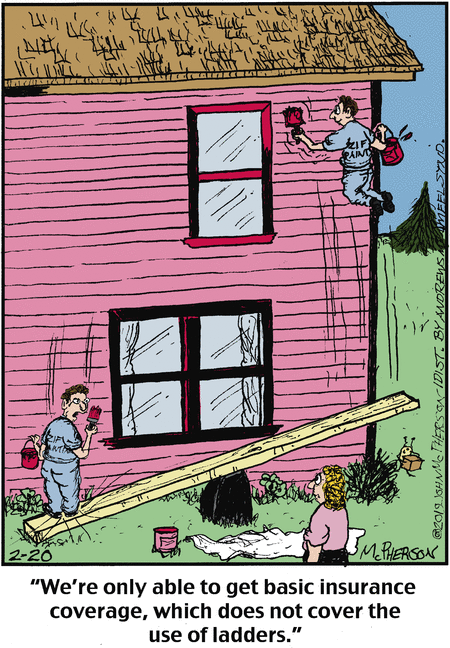 I think the outcome may have been different had the defendant had an expert who opined that the ladder was an appropriate safety device for the exact task being undertaken, and there being a question of fact as to whether or not the ladder moved causing the fall. Spencer v 322 Partners, L.L.C. Plaintiff injured his elbow when the ladder he was using in defendant's building fell over, while opening a splice box to splice the telephone wires inside. The trial court granted defendant's motion for summary judgment dismissing plaintiff's claim under Labor Law § 240(1). The First Department unanimously affirmed, finding plaintiff's actions of opening a splice box affixed to the wall and splicing telephone wires therein while on a service call for a customer of his employer did not constitute an alteration of the building, but rather routine maintenance (see Rhodes-Evans v 111 Chelsea, LLC, 44 AD3d 430, 431-33 [1st Dept 2007]; Ventura v Ozone Park Holding Corp., 84 AD3d 516, 517 [1st Dept 2011]). PRACTICE POINT: This is just one of those scenarios you need to remember, or call us if you need to be reminded, splicing or attaching wires is not an alteration as long as you are not changing the building or structure in any way. If you are, however, installing a satellite dish by putting a few screws into the roof, you have altered the building and then it is a Labor Law case under §240(1). Buttigieg v Marlin Mech. Corp. Plaintiff Savior Buttigieg allegedly was injured when he slipped and fell on construction debris as he was walking down a ramp to a service elevator located in the basement of the hotel where work was being performed. The trial court granted third-party defendant Laurmar’s motion for summary judgment dismissing plaintiff's Labor Law § 200 and common-law negligence claims. The Appellate Division, First Department held third-party defendant Laurmar met its burden of demonstrating the general contractor, Marlin, neither created nor had constructive notice of the dangerous condition. It submitted evidence Marlin did not control the site at the time of the accident, as it occurred between construction phases, and that the area was clear of debris when Marlin left the site three weeks prior to the accident. Plaintiff did not offer any evidence to refute this showing, nor did he plead constructive notice based on a recurring condition. PRACTICE POINT: Plaintiff’s claims against the defendant were dismissed in this case on the motion of a third-party defendant. It is important to remember a third-party defendant may utilize all the procedural weapons which the law gives to the original defendant for defeating plaintiff's claim. Haynes v Boricua Wil. Hous. Dev. Fund Co., Inc.
Plaintiff’s testified at his deposition that he was performing his assigned tasks of installing pins in a drop ceiling using a Hilti gun when he received an electrical shock, and that exposed, uncapped electrical wiring was seen by his supervisor hanging from the ceiling in the vicinity of where he was working immediately thereafter. According to plaintiff’s coworker, after his incident, electricians were observed working in the building and capping the exposed wires. However, the owner of plaintiff’s employer, Calhoun, testified that he arrived at the incident site and saw no exposed wiring or any other signs of anything unusual. The trial court granted plaintiff's motion for partial summary judgment on the issue of liability on his Labor Law § 241(6) claim against defendants Boricua Village Housing Development, Boricua Village F, LLC, and Knickerbocker (collectively, defendants), denied Knickerbocker's motion for summary judgment dismissing the Labor Law § 200 and common-law negligence claims against it, denied Knickerbocker's summary judgment motion on its contractual indemnification claims against third-party defendants United and Evergreen, and denied defendants’ summary judgment motion against Evergreen for common-law indemnification. The First Department affirmed the trial court’s granting of summary judgment to plaintiff under Industrial Code (12 NYCRR) 23-1.13(b)(3) and (4); pertaining to the investigation, warning, and protection of employees from electrical shock in proximity to performing their work. The Court held that defendants failed to raise an issue of fact as to whether those provisions were violated, and that such violation proximately caused plaintiff’s injuries. The Appellate Division, First Department affirmed the trial court’s denial of summary judgment on Knickerbocker’s motion for summary judgment as to Labor Law § 200 and common-law negligence. While it was undisputed Knickerbocker did not direct the means and methods of plaintiff’s work, the Court found questions of fact regarding whether Knickerbocker had notice of a defective condition on the premises that caused plaintiff’s injuries. Where Knickerbocker has not been determined to be free of negligence they are not able be granted contractual indemnity from their sub-contractors. In fact, until the issue of their negligence is determined none of the indemnity issues can be decided for contractual or common law indemnity. Plaintiff's decedent, Brown, contracted mesothelioma and died as a result of his exposure to asbestos during his work installing insulation at various commercial sites from 1958 to 1974. For approximately three months in 1958, Brown worked for nonparty Asbestos Construction Company at the powerhouse in Astoria, Queens. Keasbey was also a subcontractor. While there, Brown worked in close proximity to Keasbey employees, who used asbestos-containing concrete products, including Rex and Rakco concrete manufactured by Keasbey. From the winter of 1964 until the spring of 1965, Brown worked for Keasbey as an asbestos installer at the Con Ed plant in Ravenswood, Queens, and used Rex and Rakco. From 1965 to 1973, he worked for other companies. From 1973 to 1974, Brown again worked for Keasbey. The trial court entered a jury verdict in favor of plaintiff and apportioning liability 30% to defendant Con Ed and capping the net verdict against Con Ed at 30%. The Appellate Division, First Department reversed the trial court’s verdict entered against Con Ed, capping its net liability at 30%. The jury found Con Ed exercised supervision and control over workers at the powerhouse and failed to exercise reasonable care to make the worksite safe and, that failure was a substantial contributing factor in the decedent’s injuries. Consequently, Con Ed properly should have been assigned its own liability (30%) and that of decedent’s employer, Keasbey (35%), against which plaintiff could not bring a direct action based on its status as the employer. Therefore, CPLR 1602(4) applied and permitted allocation of Keasbey’s share of liability to Con Ed. Following Hurricane Sandy, there was water and debris present throughout the basement of a building in Brooklyn owned by defendant Stacey Austein. Defendant Lance Austein, Stacey Austien's husband, retained defendant Servpro to perform “all necessary cleaning and/or restoration services” on the property. Plaintiff, a general laborer, was employed by Servpro to assist in the clean-up and restoration of the premises. Plaintiff’s work consisted primarily of filling trash bags with debris from the basement and then placing those bags at the roadside. In order to perform the work, plaintiff repeatedly had to traverse an exterior stairway which led from the rear of the building down to the basement entrance. While exiting the basement on one of his trips, plaintiff allegedly was injured when he stepped into an uncovered drain hole at the bottom of the stairway outside the basement door. The trial court denied the motion of the Austeins for summary judgment on the Labor Law § 241(6) claim and granted their motion for summary judgment on the Labor Law § 200 claim. The Second Department affirmed the trial court’s denial of Austeins’ motion for summary judgment, as Industrial Code regulation 23-1.7(e), which prohibits tripping hazards in passageways and workings areas, is sufficiently specific to support a Labor Law § 241(6) claim and the Austeins failed to show that plaintiff’s alleged injury did not result from the presence of a tripping hazard in the passageway upon which he traversed when his foot became caught in an uncovered drain hole. Notably, the Court declined to consider the Austeins’ argument that plaintiff was engaged in mere “routine maintenance” and thus did not come within the statutory protections because it was not properly before the Court since it was only raised for the first time on appeal. Affirming summary judgment to the Austeins on plaintiff’s claims under Labor Law § 200 and common-law negligence, the Appellate Division, Second Department found the Austeins demonstrated they neither created nor had actual or constructive notice of the alleged defects in the premises plaintiff claimed were the cause of his injuries (uncovered drain hole and inadequate lighting). Moreover, they established there was a blackout in the neighborhood requiring plaintiff’s employer to provide emergency lighting, the placement of which lighting the Austeins did not have authority to direct or control. Plaintiff was hired by defendant Mahendralall Lal to cut down a tree branch at a home owned by Lal and his wife, Ganwattie Lal. While standing on a ladder and cutting the branch, plaintiff was struck by something—he did not know what, other than that it came from above him—and he fell off the ladder and was injured. Plaintiff testified at his deposition that Lal was actually present, told him how to go about cutting the tree branch, and actually participated in the work. Lal testified at his deposition that after telling plaintiff which branch he wanted plaintiff to cut, he left the premises and was not present when plaintiff was injured. The trial court granted defendants’ motion for summary judgment dismissing the complaint alleging violations of Labor Law §§ 240(1), 241(6), 200, and common-law negligence. With respect to the Labor Law §§ 240(1) and 241(6) claims, the Second Department found triable issues of fact with respect to both since the main factual issue in dispute is whether Lal directed the performance of plaintiff's work, and the Court held the deposition testimony presented conflicting evidence on that issue. According to the Court, the only issue properly before it is whether the exception to those statutes for “owners of one and two-family dwellings who contract for but do not direct or control the work” is applicable. In determining whether a homeowner is entitled to that exemption, the Court held the conflicting evidence demonstrated a triable issue of fact as to whether Lal supervised the method and manner of the actual work and, if so, to what degree. As defendants did not timely raise their contention that Labor Law §§ 240(1) and 241(6) did not apply to the tree-cutting activity in which plaintiff was engaged, that contention was not properly before the Court. PRACTICE POINT: The court’s most important ruling here is that the homeowner exception is the only issue properly before them. That is because a tree is neither a structure nor a building. It appears to me that the argument that missed was that this is simply not a §240(1) case as the violation requires that the plaintiff be working on a structure or building and here a tree does not qualify as it is not made of component parts. The argument about control over the plaintiff by the owner is one that never needed to be made. The Appellate Division, Second Department reversed the trial court’s order granting summary judgment to defendant on the Labor Law § 200 and common-law negligence claims. It found a question of fact existed regarding whether the defendants had the authority to control the means and methods of the plaintiffs work. Byrnes v Nursing Sisters of the Sick Poor, Inc. Plaintiff allegedly injured his back while performing a seasonal “start-up” of a cooling tower on defendant’s HVAC system, which consisted of transitioning the HVAC system from heating to cooling. As part of the work, plaintiff and his coworker needed to reinstall a circulation pump on the HVAC tower, which had been removed for the winter months. To do so, plaintiff tied a rope around the circulation pump, passed the rope over the top of an overhead beam, and pulled from the other side to raise the pump off the ground for about 20 or 25 minutes so his coworker could install it in the cooling tower. The trial court denied defendant’s motion for summary judgment on the Labor Law § 241(6) claim. The Second Department reversed and granted defendant’s motion for summary judgment because the facts establish that the work plaintiff was performing at the time of his incident consisted of routine maintenance, which is outside the scope of Labor Law § 241(6). Gomez v Kitchen & Bath by Linda Burkhardt, Inc. Plaintiff, a painter employed by nonparty Edgar Duchi, allegedly was injured when the A-frame ladder on which he was standing collapsed, causing him to fall. Plaintiff testified at his deposition that the ladder his supervisor provided to him had a broken lock, and that in order to hold the ladder open, his supervisor inserted a screwdriver into a hole and used the screwdriver as a makeshift lock. Plaintiff further testified that he complained about the defect to his supervisor, but his supervisor failed to correct the problem. After he fell, plaintiff noticed that the screwdriver had fallen out. The trial court granted plaintiff's summary judgment motion on his Labor Law § 240(1) claim. The Second Department affirmed the trial court’s finding that plaintiff's deposition testimony established, prima facie, that defendant, as the general contractor, violated Labor Law § 240(1) by providing a ladder with a defective lock, which caused the ladder to collapse and plaintiff to fall to the ground. In opposition, the Court held defendant failed to raise a triable issue of fact. He submitted certified records from a hospital, which contained notations that plaintiff was injured when he lost his balance and fell from a scaffold. However, the notations in the hospital records upon which the defendant relied were not attributed to plaintiff. As the defendant failed to offer evidence sufficiently connecting plaintiff to the statements in the hospital records, the party admission exception to the hearsay rule does not apply. Moreover, none of the notations were germane to plaintiff's diagnosis or treatment and, at trial, would not be admissible for their truth under the business records exception to the hearsay rule. While hearsay statements may be used to oppose motions for summary judgment, they cannot, as here, be the only evidence submitted to raise a triable issue of fact. PRACTICE POINT: Early and thorough investigation is critical. If the hospital records have a statement that the plaintiff lost his balance and fell, there is likely an individual who heard the plaintiff say so, and that would have made a huge difference here. Statements from all those on the accident scene as well as those who spoke to the plaintiff following the accident are important sources of information. Once a statement like this is located in the medical records, steps should be taken to confirm the statement where possible. The trial court granted plaintiff’s cross-motion for summary judgment on his Labor Law § 240(1) claim, dismissed defendant’s tenth affirmative defense that plaintiff was a recalcitrant worker, and denied plaintiff's cross-motion pursuant to CPLR 3126 for preclusion of documents related to defendant’s alter ego defense that had not been produced in discovery. The court also found triable issues of fact with respect to defendant's alter ego defense and denied defendant's motion for summary judgment and those branches of plaintiff’s cross-motion which were for summary judgment dismissing the defendant’s eighth and ninth affirmative defenses excluding them from liability under the Workers' Compensation Law under the alter ego and special employer status. The Second Department modified the order to deny plaintiff’s motion to dismiss defendants eighth and ninth affirmative defenses. The Court held defendant failed to make a prima facie showing that it and Westchester Management, LLC, operated as a single integrated entity, just that they were closely related. Defendant’s submissions demonstrated that it and Westchester Management are closely related. However, the Court found defendant’s submissions also demonstrated that the Bergmans have been careful to maintain defendant and Westchester Management as separate and distinct from each other. Among other things, neither entity is a subsidiary of the other, the entities were formed for different corporate purposes, the defendant maintains its own bank account separate from that of Westchester Management and pays its own expenses, and separate Schedule C’s are filed for each entity for tax purposes, albeit as part of the Bergmans' personal income tax return. Defendant and Westchester Management are parties to a management agreement which provides that Westchester Management will act as an agent for defendant with regard to the management and maintenance of the defendant's property. Westchester Management's employees perform maintenance and superintendent services at various properties owned by all of the entities controlled by the Bergmans, not only defendant, and the employees are paid with checks drawn on the account of Westchester Management only. Defendant, on the other hand, itself employs contractors to perform construction work at its premises beyond that which the employees of Westchester Management are able to perform, such as the installation of a new roof, and pays those contractors with checks drawn on defendant’s account. In addition, nonparty Juan Ovalles, an employee of Westchester Management, testified at his deposition that he was unaware that the properties he and his coworkers maintained were also controlled by the Bergmans, including defendant’s premises. The Court held plaintiff's submissions established, prima facie, that defendant is not an alter ego of plaintiff's employer, and that tenants at defendant's rental property enter into a lease agreement with defendant, and not Westchester Management, and the Worker's Compensation Policy for Westchester Management is for the benefit of its own employees only, when those employees are working at various locations, including, among other locations, the property owned by defendant. In opposition to plaintiff's prima facie showing, the Court held defendant failed to raise a triable issue of fact. With respect to the special employee defense, the Court further held that plaintiff met his prima facie showing and defendant failed to raise an issue of fact since his submissions established that he was not a special employee of defendant at the time of his accident. Among other things, plaintiff submitted evidence that he and the employees of Westchester Management are paid by checks drawn on the account of Westchester Management, irrespective of the property at which they are directed to work, and that the ladder and other equipment used by plaintiff at defendant's premises were owned by Westchester Management. In addition, the management agreement between defendant and Westchester Management requires Westchester Management to employ persons to maintain the property where plaintiff was injured, and to pay their salaries. PRACTICE POINT: Alter ego and special employee defenses can be strong but they are entirely fact dependent. I always encourage the affirmative defense of exclusivity based in §11 of the Workers' Compensation Law whenever you think that the defense may be appropriate. Plaintiff and his deceased wife were hired to hang wallpaper in a newly constructed office building, which was owned by Granite. Kulka had contracted with Granite to serve as the site construction manager. It had been snowing the day before the day plaintiff and decedent were scheduled to commence work in the building, but on that day, the snow changed to rain. It was raining on the morning of the incident, when the decedent drove her vehicle, with plaintiff as a passenger, to the job site. When plaintiff and decedent were unable to enter the building through the front entrance, decedent drove the vehicle through an opening in a fence onto the upper deck of an adjacent parking garage that was still under construction. When the vehicle was approximately halfway between the opening gate in the fence and the leading edge of the parking garage, decedent informed plaintiff that she could not stop. The vehicle slid on the ice until it reached the edge of the incomplete parking garage, broke through the steel cable guardrail system, and fell approximately 32 feet into an excavation pit in the location of the lower level of the garage. Plaintiff jumped out of the vehicle before it fell, and watched as the vehicle fell into the pit with the decedent, who screamed his name out while the vehicle fell, and died at the scene. Both party’s moved and cross-moved to set aside the jury verdict on the issue of liability as contrary to the weight of the evidence, and for a new trial. The Appellate Division, Second Department affirmed denial of defendant Kulka’s motion to set aside the verdict as to liability. It found a rational jury could have found that Kulka was acting as a general contractor on the site, exercised control over the worksite, and had actual or constructive notice of the hazardous condition that caused the accident. The testimony demonstrated there was no general contractor on site, and Kulka, as construction manager, took on the duties of a general contractor and, therefore, was responsible to make sure the jobsite was safe. PRACTICE POINT: This case again demonstrates that the title of the entity (construction manager, general contractor, prime contractor, etc.) is not necessarily dispositive. If a construction manager is delegated the authority and duties of a general contractor, or if it functions as an agent of the owner on the premises, it may become responsible for the safety of workers under Labor Law § 200. 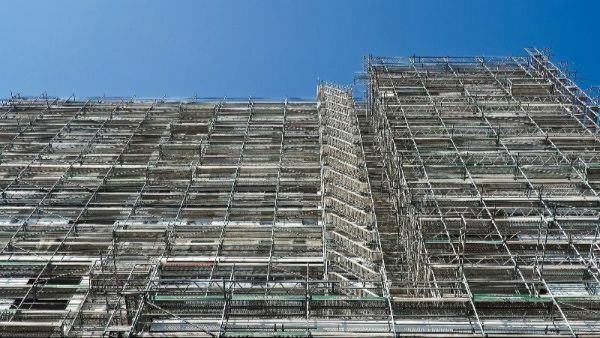 Plaintiff allegedly fell from scaffolding while working. The Court of Claims granted plaintiffs’ summary judgment motion on the Labor Law § 240(1) claim. At a bench trial, the Court awarded Plaintiffs $2.4 million in damages, which included $400,000 for past pain and suffering and $600,000 for future pain and suffering for the husband, and $25,000 for wife’s past and future loss of services. Defendant’s subpoenaed worker’s compensation records and testimony of nonparty claims administrator of employer’s worker’s compensation policy, which was quashed at the claims administrator’s request. PRACTICE POINT: It is not often that we address the post-trial issues here but this is an important one not only for post-trial motions but also for mediations and settlement discussions as it affects the value of a case. Future medical value is not reduced by the availability of comp to pay those expenses as the payments by comp produce a lien. I have heard experienced practitioners argue that the future medical expense should be reduced based on comp; but that is statutorily precluded. 12 NYCRR § 23-1.16 – Protection in Construction, Demolition and Excavation Operations; Safety belts, harnesses, tail lines and lifelines. Regulation § 1.16(b), prescribes standards for the use of safety belts and harnesses, and is sufficiently specific to sustain a Labor Law § 241(6) cause of action. Ramirez v Metropolitan Transp. Auth., 106 AD3d 799, 965 NYS2d 156 (2d Dept 2013). Jerez held reg is sufficiently specific to support a § 241(6) claim, and potentially applicable where none of the conditions specified in the regulation were satisfied. Anderson held 1.16(b), which requires the use of safety belts, and harnesses and provides that such equipment must be [a] properly attached either directly to securely anchored trail line, securely anchored hanging lifeline or tail line attached to securely anchored hanging lifeline and [b] arranged so as to preclude fall greater than five feet, is sufficiently specific to sustain a Labor Law § 241(6) cause of action.